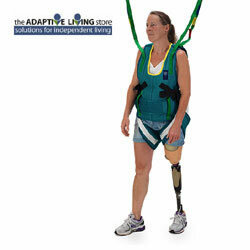 The Walking Jacket with loop attachment is used for standing and walking practice with a patient lift. The Walking Jacket has been designed to be used in conjunction with ArjoHuntleigh patient lifts such as the Maxi Move and the ceiling lift system Maxi Sky. The Walking Jacket, which is applied to a 2-point loop spreader bar, provides safe and stable support during walking and stepping exercises. Safe Working Load of 190 kg/418 lbs. The Walking Jacket can be easily applied to a patient sitting in a chair, avoiding the need for potentially hazardous manual handling. For maximum patient comfort it has been designed to put no excessive pressure on the chest. The Walking Jacket is fully adjustable across the width and length to suit a variety of patient sizes and allows uninhibited walking action.